Carex grayi, known as Mace or Morning star sedge. The flowers do have the appearance of the medieval weapon with the same name! The plant has attractive pleated foliage of bright light green which is clump forming. 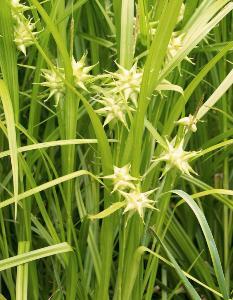 The flowers are very showy, spiky and globular in shape, green in colour later turning chocolate brown during May - June. Prefers moist woodland, can grow in full sun but requires moist soil to make the foliage look healthy and lush. Height 1m, flower height 40-120cm. Supplied in a 9cm pot.